The June 2018 featured article in Biocycle Magazine is the Optima KV project. The article is written by Craig Coker , a Senior Editor at BioCycle. The project is hailed as the newest renewable energy project to come on line in North Carolina. 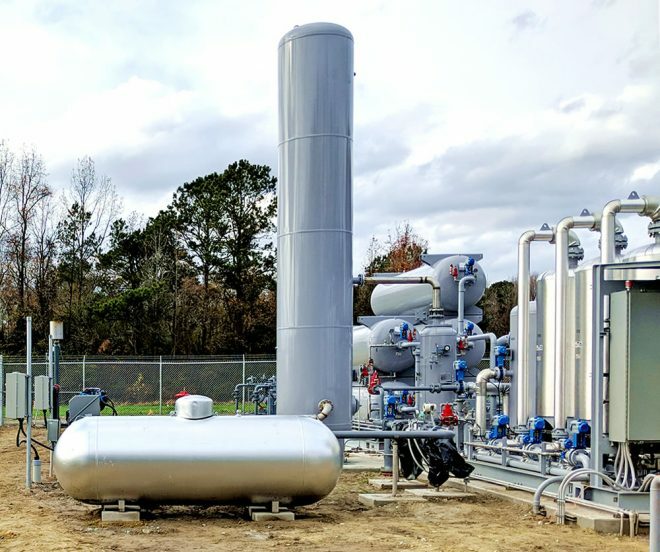 The article accurately describes how Optima KV is capturing the manures from several Smithfield farms and refining it to make Renewable Natural Gas. The in-ground anaerobic digesters, pictured above that cover the lagoons at each farm are made of high-density polyethylene (HDPE) liners. The waste from the pigs at each farm is flushed into the digesters. Each farm is outfitted with a low-power compressor that pulls the biogas from beneath the covers, filters it to remove particulates, and removes the moisture through a condenser. The preconditioned biogas is routed to a central gas clean-up facility on Smithfield Foods’ property (about 3 miles distance from the farms) through low-pressure piping. Each farm is equipped with emergency flares if there is an operational issue with the central facility. The BIG NEWS here is that is the first project to put Renewable Natural Gas in the pipeline in the whole state. Optima KV is a collaborative venture between Smithfield Foods, two local swine herd farmers, engineering firm Cavanaugh Associates, and outside investors to make Renewable Natural Gas (RNG, also called biomethane). Manure is pumped from the animal barns into a HDPE-lined and covered in-ground digester at each of the five contiguous farms housing 60,000 pigs owned by the two farmers. These digesters vary in capacity from 1.7 million to 3 million gallons. In the event of operational issues with the digesters, a gravity emergency spillway will redirect the manure back to the original wastewater lagoon. The digesters are mixed with liquid re-circulation pumps, which can also be used for sludge removal from the digesters. The digesters are equipped with internal baffles that help separate solids and liquids so the hydraulic residence time for the liquid fraction is about 30 days, while the solids residence time is about 90 days. The gas upgrading system (GUS) at Optima KV consists of pressure-swing absorption to remove CO2, H2S and other constituents. Cleaned biomethane is pressurized to be sold to Duke Energy via its subsidiary, Piedmont Natural Gas.